From the second leg of V. League 2019, the VAR system will be used in the tournament. After consultations with Thailand, the Vietnam Professional Football Joint Stock Company (VPF) has identified two options for using the VAR in V. League. One option one is to build a VAR center in Hanoi since the city has good facilities and high quality connections to receive signals from stadiums from afar. However, this option was considered too expensive since it can cost VND15 to 16 billion ($644,000 to 688,000) a year and it’s not easy to receive signals from stadiums that are located in distant places like Pleiku in the Central Highlands, more than 1,000 kilometers (620 miles) to the south. The second option is to equip vans with all the VAR equipment to go to the stadiums. Each van would cost about VND6 billion ($258,000). VPF Chairman Tran Anh Tu said that he will choose the second option. However, with current resources, VAR can only be used for a maximum of three games per round. “VPF chose the second option because it’s more mobile. We have bought minivans and will sign a deal with a professional company to install all the equipment on them,” Tu said. “At least two games will get to use VAR in a round, as long as the venues are not too far from each other…. And all the equipment used must meet FIFA standards before they are used in official games,” he said. There will be two referees and two technical support staff in a VAR van. VPF will carry out a training course on VAR for the referees. 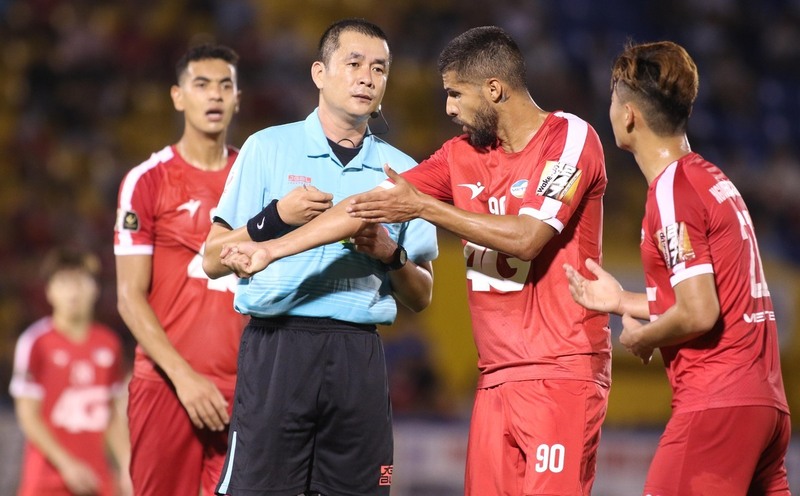 In one recent controversial V. League match, Binh Duong FC beat Viettel 1-0 on April 8 but Viettel players insisted that the goal was invalid because the ball had touched Waner Luiz’s arm before the Binh Duong’s forward brought it into the net. The Vietnam Football Federation (VFF) has supported the decision to use VAR. A VFF respresentative said VAR will be used to decide whether a goal has been scored or not, whether a direct red card or a penalty can be given or not, and to correct wrong decisions by the referees. “But players cannot force or put pressure on the main referee to use VAR,” the source said. At the recent World Cup, the VAR had proved its use by minimizing controversial decisions. Many major leagues like Spain’s La Liga and Germany’s Bundesliga began to use it last year. There will be a control room (the minivan in Vietnam) where four assistant referees will review footage from many on-field cameras and make and communicate their decision to the referee through the earpiece. On-field referees can themselves review the footage on a screen near the sidelines. At the Asian Cup 2019, Vietnam and Japan were the first teams that played in a match using VAR. Japan scored the only goal of the game from penalty spot after the referee reviewed the situation on VAR.